Brooklyn Funk Essentials is an all-star group. It’s like they took Sly Stone’s idiom “Everybody is a star” and built a band around it. As anyone who has been following them for a while will tell you, BFE is a group where everybody shines. “Brooklyn”, as it relates to the band, is a symbol for mixing it up - male and female, any race, creed, color, sexual orientation or age - all music, so long as it’s funky! Today’s Brooklyn Funk Essentials is built on the nuclear six-piece of Anna Brooks (sax & vocals), Desmond Foster (guitar & vocals), Lati Kronlund (bass), Alison Limerick (vocals), Hux Nettermalm (drums) and Iwan VanHetten (trumpet, keyboards & vocals). But the BFE thing started over twenty years ago, in Arthur Baker’s Shakedown studio on Pavonia Avenue in Jersey City. Lati Kronlund and Arthur Baker at Shakedown Sound in 1993. Brooklyn Funk Essentials happened as a result of a drummer not showing up for his studio session for the Al Green album, which Arthur Baker was producing in the winter of 1993. Sort of. So instead of recording drums, Arthur and fellow producer Lati Kronlund, spent the afternoon putting together funky grooves using old unused recordings from Baker’s vast tape cabinet. These recordings featured the talents of people like Maceo Parker, Lenny Pickett and the Tower Of Power horns, Michigan & Smiley and Dizzy Gillespie. In the next few days, Baker and Kronlund invited musicians, rappers, poets and DJs from the buzzing New York club scene to jam with them in the studio. This is how Brooklyn Funk Essentials’ debut album ‘Cool & Steady & Easy’ came to be. Lati was the band’s leader and bass player. He was joined by the original horn section consisting of Joshua Roseman (trombone), Bassy Bob Brockmann (trumpet) and Paul Shapiro (sax & flute). On lead vocals: Sha-key (later known as Hanifah Walidah), Joi Cardwell, Papa Dee and Stephanie McKay, and with Everton Sylvester and David Allen on dub-poetry. The drums were handled by Yancy Drew and E.J. Rodriguez played percussion. Yuka Honda was the band's first keyboard player, but she was soon replaced by ATN Stadwijk. Bill Ware III played the viberaphone on the first album and also gigged a lot with the band in the early days, as did DJs Jazzy Nice and Smash Hunter. Brooklyn Funk Essentials debut album was first released by the UK label Dorado Records in 1994 in Europe, but it was soon picked up by RCA’s Groovetown imprint who released a slightly reworked version of the album in 1995 in the US and the rest of the world. The first single – a funky reggae-inspired reworking of Pharoah Sanders and Leon Thomas' classic ‘The Creator Has A Master Plan’ became an instant hit, reaching the Top 20s in certain countries. The album, which topped Billboard Magazine’s ”Best R&B Album Of The Year 1995”, also featured songs like ‘Big Apple Boogaloo’, ‘Take The L Train’, ‘Dilly Dally’ and ‘A Headnadda’s Journey To The Planet Adidi – Skizm’, all of which became classics of the genre. The popular album cut 'Bop Hop' was featured in a world wide Nike commercial featuring Grant Hill and ‘Take The L Train’ became a signature tune for Hennessy Cognac’s TV ads. The video for BFE's first single was shot on location in New Orleans and in Joshua Tree in California. It was directed by Michael Halsband. Apart from being regulars on the New York club scene, BFE began touring the world marking highlights in the company of acts like Parliament Funkadelic, The Roots, James Brown, Jamiroquai, The Meters and Ben Harper. One of these tours found the group headlining the Fuji Jazz Festival in Istanbul, Turkey. The reception was so positive that BFE went back to record their second album there in 1998, together with eleven Turko-Roman folk musicians know collectively as Laço Tayfa, which among others included the young clarinet player Hüsnü Senlendirici. The result was the album ‘In The BuzzBag’, which became a milestone in Anatolian collaborative projects and earned BFE a Grammy nomination at home in the US. It also escalated the group to a stadium capacity act in Turkey, which also enabled a lot of touring in Europe. ‘In The BuzzBag’ was recorded during nine hectic days in Istanbul, but before that Brooklyn Funk Essentials had already started working on a follow-up to the debut. However, the Turkish label, Pozitif, that had financed 'In The BuzzBag', wanted it out immediately, feeling that they had a possible hit on their hands. So this is how the third album actually became the second, and how ‘Make Them Like It’ didn’t get released until 2000. ‘Make Them Like It’ (Dorado/PIAS/Shanachie) naturally concluded where the first album left off: A mixture of funk, boogie soul, Latin, ska, jazz, R&B, drum & bass and hip hop. The album featured fan favorites such as ‘I Got Cash’, ‘Mambo Con Dancehall’, ‘Jump Around Sound’ and ‘Woman Thing’. It also introduced the guitarists Masa Shimizu and Desmond Foster to the groups sound. “Yes! Le 3eme album du Brooklyn Funk Essentials enfin dans les bacs! … cet album est une veritable tuerie! … un croisement hybrid entre Maceo Parker, Erik Truffaz, Sly And The Family Stone et George Clinton. Jamais rébarbatif et en constante evolution, BFE est, et reste, le groupe le plus métissé de la planète. Du grand art! At the end of 2000, after some extensive world touring, many band members wanted to pursue solo careers. Iwan VanHetten replaced both ATN Stadwijk on keys and Bassy Bob Brockmann on trumpet and also became the band’s Musical Director. André Atkins took over the trombone spot after Josh Roseman and Tony Taylor replaced Yancy Drew on the drums. Dave Jensen took over from Paul Shapiro on saxophone, and Philippe Monrose stepped in behind the percussion instead of E.J. Rodriguez. Stephanie McKay relocated to the UK to record her first solo album. 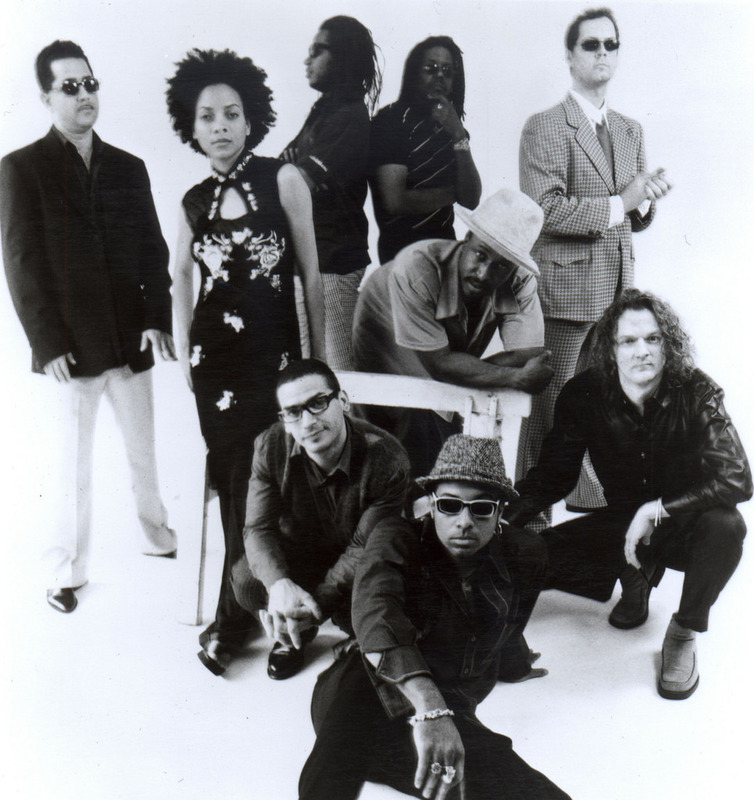 With this new line-up, Brooklyn Funk Essentials toured the world throughout the spring and summer of 2001, ending with a show at the Vieilles Charrues Festival in France, where the band played to a crowd of 80,000 people. But shortly after returning to New York from this tour, the attack of 9/11 happened - and this would change the perimeters for the band for some time, as many band members moved away from the city, including Kronlund, who relocated to Paris. It would be five years before the band got back together again. It was the opportunity to tour three world continents that eventually brought the band back together again in 2006. And while they were touring, the band started writing new songs which would end up on their fourth studio album, ‘Watcha Playin’, released in 2008 (Comet/Tropical/DoubleMoon). Yancy Drew was back behind the drums and Iwan VanHetten was still on keys and trumpet. Desmond Foster and Masa Shimizu were still on guitars and Lati Kronlund played bass and produced the album again. The absence of a regular horn section meant that there was a lot of space for the vocals of Hanifah Walidah, Everton Sylvester and Papa Dee. Erik Hausler played sax on the album and toured for several years with the band before being replaced by Anna Brooks in 2011, when Andre Atkins and Tony Taylor would also be back on trombone and drums, respectively. ‘Watcha Playin’ also included three songs where the band was reunited with Hüsnü Senlendirici and his clarinet. Among many other gigs, this line-up played a much celebrated show at New York’s Central Park Summer Stage in 2010. The songs ‘Dance-Free Night’, ‘The Park’ and ‘Dibby Dibby Sound’ became new audience favorites, and in ‘The Day Before Adidi’, Hanifah Walidah reconnected with the classic space jam ‘A Headnaddas Journey To Planet Adidi-Skizm’ from the band’s 1993 debut. BFE supported the album by extensive touring in over 20 countries and sharing stages with artists like Iggy & The Stooges, Seun Kuti, George Benson, The B-52s, Bootsy Collins, Graham Central Station, Erykah Badu and Underworld. In 2014, Brooklyn Funk Essentials began work on a new album to coincide with the band's 20 year anniversary as a live act. In addition to the core touring unit, the album brought together many of the band's past members as well as newer talents like Anna Brooks on saxes and whiz kid Hux Nettermalm on drums. The album was recorded in studios in Brooklyn, Birmingham and Stockholm and among it's highlights was 'I'm Gonna Find Me A Woman', a re-working of a never released song that the band had recorded in the late nineties with the late, great Isaac Hayes. The first single, 'Blast It!' was released in October 2015, and featured the combined vocal talents of Papa Dee, Everton Sylvester, Desmond Foster, and Stephanie McKay, who also sang lead on 'Prepare', a co-write with legendary house diva Crystal Waters. Joi Cardwell was back on lead vocals on the second single 'Dance Or Die' as well as on BFE's reworking of Roy Davis Jr and Peven Everett's classic 'Gabriel'. BFE were also back with their original label, Dorado Records, who released the album worldwide in November 2015.